A membership club that rents rooms out is charging its members fees. However, it has hit back at claims in a national newspaper story and says it has found a new concept. Lettings fees charged to tenants are due to be banned, but the ban does not target membership fees charged to club members. Lifestyle Club London does not describe itself as a letting agency but as a “leading housing community”, where members are offered the chance to “live and move between all of our properties”. Members do not have tenancies, but occupy under a licence. 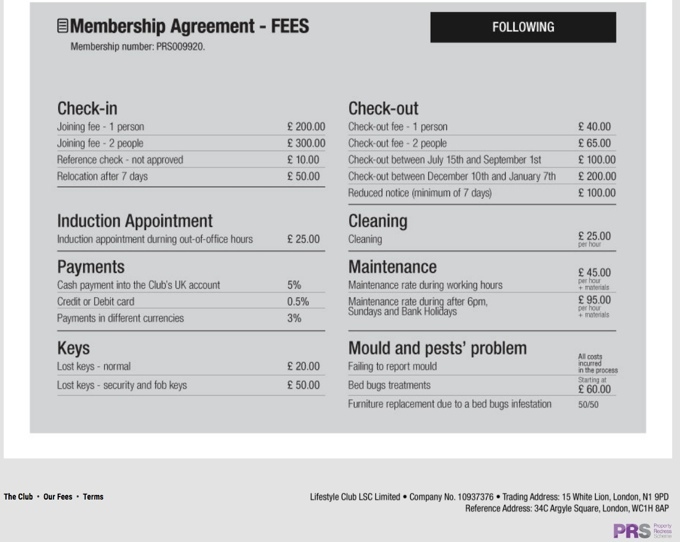 Its membership terms included the payment of a non-refundable joining fee; and a membership fee which “equals the monthly contribution”, and which is paid once a month. The conditions also state that the club management reserve the right to enter any property or bedroom without notice at any time, although the club will try to provide 24 hours notice. There is also a section on breaches and penalties, which can be “imposed and waived” strictly at the discretion of the club. Members are allowed to secure their bedrooms with a coded padlock, but the code must be given to the club in order to give access. Gross breaches will have a £200 charge “and shall lead to immediate termination”. Such breaches are defined as gross misconduct, acts of bad faith, willful or intentional damage, and gross negligence. If the club does terminate a member without notice, then it says it will provide a seven-day stay at hostel accommodation in London. The Guardian has highlighted Lifestyle Club London, describing it as a “lettings agency calling itself a ‘membership club'”. The article says it is exploiting a grey area of the law. It quotes the experiences of one club “member”: he and his eight house mates were fined £90 for leaving dirty dishes in the sink, and £225 for removing notices taped to the fridge warning of penalties for drug taking and dirty kitchens. Lifestyle Club London displays the Property Redress Scheme logo. “It is very disappointing to see that the author of the article has decided to overlook the explanations that we have provided. “There are still a few inaccuracies and exaggerations. We do not make members pay for appliances or apply excessive cleaning charges. We only charge members when the appliances have been broken due to negligent use. These types of charges are standard in normal tenancies. If a tenant breaks an appliance due to negligent use, he/she should pay for the replacement of the appliance. “Regarding unannounced visits, all properties are cleaned and inspected twice per month as per our Membership Agreement. Our members occupy bedrooms within club properties and by membership rules of the club. Its members are responsible for keeping the properties free of health and safety hazards. This is also stipulated within the Membership Agreement. “It is clear by looking at the title [in the Guardian]: The lettings club where tenants are fined £90 for leaving dirty dishes, that the idea was to make us look bad. “Regarding our concept and how legislation adapts to it, there is definitely a grey area without clear legislation for a new concept like ours. “In a city like London there will always be new ways for people to find and provide services while the demand is there. Our concept allows people to move into central London accommodations in the same day and relocate between properties with 24 hours’ notice as many times as they please. “They share with other club members and therefore with the club itself. There is never a landlord-tenant relationship created and this is in the main declaration on the first page of our Membership Agreement. “Our concept has been challenged a few times by individuals and institutions and it is clear that we have found something that no one else has found before. We are committed to continue to promote our concept and find a way to make most people happy. Writing today in Nearly Legal, lawyer Giles Peaker is strongly critical of the model, and says it should be tested in the courts. He also names others that use the same, or similar, concept and says these people “have no place at all in residential letting”. Isnt it illegal to charge someone for using a credit card? They operate management and lettings service …. they are a letting agent. Thinking they can get around it by using disclaimers says it all. “Agree to a licence to occupy any club managed property”. Their terms and conditions are rife with management responsibilities and charges and some are questionable as legal under the Housing Act. Question is how many of their properties are HMO!!!!! Isn’t this for properties abroad? They charge different fees during the summer months so this looks like holiday lets – not tenancies. “moved into a eight-bedroom house-share in Hackney for £900 a month”. That’s not holiday share and is an HMO? Don’t think for one minute that the build to rent brigade haven’t already thought up a way to extract huge fees from those renting their so called five star apartments. Once the pension funds learn just how challenging it is to be a landlord, will we see the same exodus from the market as we did when they also thought estate agency was easy?? This club has changed their name recently because their last name became so toxic that they couldnt continue to use it anymore even after they had staff leave reviews and paid some dodgy company to post fake reviews. They are also using another company name called splitrent. Also check out the arbitration company they request you use SHARED ACCOMMODATION PROVIDERS ASSOCIATION LIMITED. A letting agent is a term for a facilitator through which an agreement is made between a landlord and tenant for the rental of a residential property. Well now we all know they are a managing agent under the guise of a London flat sharing, taking rent from tenant as membership fee that’s combined to pay the rent. There is an interesting private landlord wanted section on their web site with terms and conditions that include: Club Management – Staff responsible for the organisation and management of the respective Premises, as appointed by the Club. Yep they are letting agents and have to comply with all legislation.